The Hirata school is very distinctive compared to other metal-carving schools. 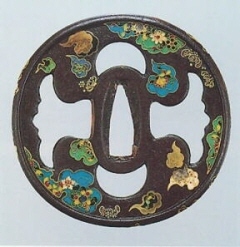 They gave cloisonne work (Seven Treasures) to their pieces of works such as Tsuba, Kozuka, Fuchi & Kashira, Menuki. The founder of this school is Hirata Donin ( ? - 1646). His given name is Hikoshiro. It is generally believed that Donin used to be a sword fitting ornaments maker (=TachiKanagu-Shi) in Kyoto at first. There are two theories how he mastered cloisonne work. (1)In 1597, Japan engaged warfare with Korea by order of Toyotomi Hideyoshi. Donin accompanied with the troops and went to Korea. He mastered cloisonne work from craftsmen in Korea. (2)Donin never went to Korea. He went to the international port of Japan, Nagasaki, and mastered cloisonne work from Dutchmen. In either case, Donin went to Sunpu of Suruga Province in 1611 on the invitation of Tokugawa Ieyasu, the first Tycoon of the Tokugawa shogunate. Donin was assigned by Ieyasu to serve as an official craftsman for the shogunate. Since Hirata Donin was disignated an official craftsman for the Tokugawa shogunate, this school took on very few apprentices and handed down the secret cloisonne work from the father to only one of his sons. This family had continued from the founder Donin in the Momoyama period to the 11th head Nariyuki in the Taisho era. Every head called himself "Hikoshiro". We can hardly find pieces of work with each maker's inscription. That's because pieces of works for the shogun family must not be inscribed.